The 136 General University Classrooms (GUCs) in Pullman are located in 30 buildings across campus. Academic Outreach & Innovation (AOI), at the direction of the Provost’s office and the General University Classroom Committee, supports technology and instruction as well as contributing to short- and long-range planning. General University Classrooms are equipped with technology to support a wide variety of media presentation, lecture capture, connection to remote presenters/campus participants and student collaborations, and engagement. Review WSU’s General University Classroom fees and use conditions. To learn more about each General University Classroom, visit Classroom Specs. For additional information about all classrooms, including departmental and general university classrooms, visit Classrooms. To schedule, visit Scheduling Office. Active learning classrooms enable instructors and students to engage in a different teaching methodology. Students engage in activities, writing, discussion, and problem solving to promote analysis, synthesis, and evaluation in class content. The instructor serves as a facilitator/director toward these activities. Students are seated in groups around the room with technology available at each table for engaging in discussion and content. The instructor has a teaching position that allows control of media and content at each student group as well as a large projected display. Students may use their own technology as a source of collaboration or utilize the fixed technology at the table as a group. Active Learning Classrooms are available in The Spark, Daggy, and Bryan Hall. Open/Informal Learning or Huddle spaces are scattered throughout the Pullman campus. Students or faculty may simply walk up and start using these spaces. Seating accommodates 6–10 people. Mobile whiteboards are located nearby. The large flat-screen display and connection points for carry-in devices (both wired and wireless) are situated as the central focus of the grouping. Spaces can be found in The Spark, CUE, Johnson Hall, Todd Hall, Dana Hall, and the Holland, Terrell, and Owen Libraries. The Spark: Academic Innovation Hub building is technology rich, providing robust systems and flexible infrastructure to accommodate the rapid pace of technology changes. 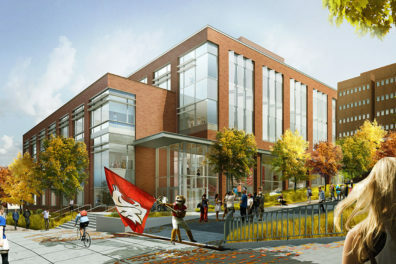 The Spark helps to create opportunities for Washington State University to accommodate student population growth, energize and enable students and faculty, and address the tremendous advances that have been made in understanding the way students learn. The Spark Design Studio is a space where faculty and students can engage in a design process / teaching style. From conceptualization to refinement, implementation, and production, the tools and space accommodate this process. Production equipment available in this space includes: workstation with various design and media tools, a laser cutter, a CNC machine, 3D scanner, and both conventional and large-scale 3D printing.